HULL, England (AP) — Liverpool's hopes of making a Premier League title challenge appear over after its poor run continued with a 2-0 defeat at relegation-threatened Hull. Juergen Klopp's side, with only one win in its last 10 games in all competitions, was sunk by a goal in each half from newcomer Alfred N'Diaye and Oumar Niasse. Liverpool, which drew midweek against Chelsea after three straight defeats, is still without a league win this year and now trails league leader Chelsea by 13 points. 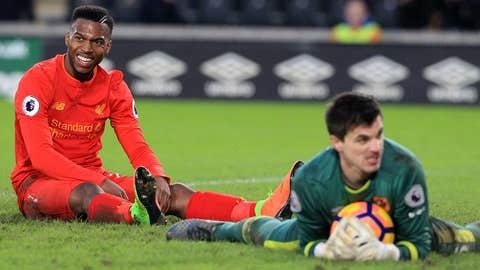 N'Diaye, on loan from Spanish team Villarreal, pounced in the 44th minute after Liverpool goalkeeper Simon Mignolet had flapped at a corner. In a scrappy game, Liverpool had more possession but failed to create enough chances to score. Philippe Coutinho wasted Liverpool's best effort when he skewed wide and Hull made sure of three points when Niasse, on loan from Liverpool rival Everton, raced clear to slot in a second goal six minutes from time.